We provide a wide range of resources for indoor play appropriate to the ages and stages of the children's learning and development. There are both free play and adult led activities on offer which includes, craft, messy play, construction and playing with the light box, dark den, and at the literacy & mathematics stations. We are lucky enough to have access to lots of outdoor space and therefore we try to make use of this whenever possible, taking the learning outdoors. Parents/carers are asked to ensure that their children are always appropriately dressed according to the weather (i.e. : raincoat, wellies, sunhat etc). Whilst outside the children can feed the animals, explore their environment (i.e. bug hunts), make dens out of both natural & man made resources. 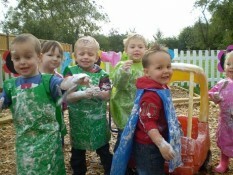 Access sit on rides, balls, the playhouse, swings, discovery tray, mark making area's, sensory garden and sand/water pits.